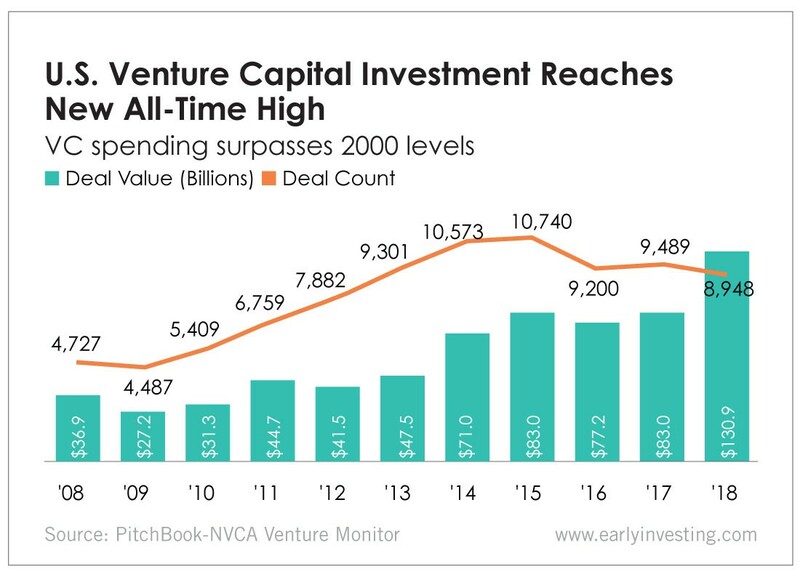 Venture capitalists just had a record year, investing $131 billion across 8,948 deals in 2018 and raising 58% more than in 2017, according to PitchBook and the National Venture Capital Association’s Venture Monitor report. Last year’s $131 billion raised beat the previous high-water mark of $100 billion set in 2000. It’s also the first time venture capitalists have raised more than $100 billion since the dot-com era. Larger round sizes and higher valuations dominated the space. Unicorns raised $44.5 billion in funding and accounted for 34% of total venture capital (VC) investments in 2018, while 62% of investments went to deals of $50 million or more. Increasing deal sizes and valuations paired with healthy deal flow suggests the fundraising environment will likely continue its strong pace, but it does call into question the impact such levels may have on capital efficiency. Our own Andy Gordon has spent a lot of time thinking and writing about the impact of venture capitalists – and their now massive investments – on the startup ecosystem. He’s not a big fan of the big checks they write. And he worries about the strings that come attached to VC funding. Fortunately, founders who reject the VC funding model have somewhere else to turn. As Andy wrote last week, one of the best alternatives is equity crowdfunding. For founders, crowdfunding attracts customers, investors and brand ambassadors. By welcoming a wide range of investors (not just the super-rich), startups gain widespread support from people who want to see their company succeed. For investors, crowdfunding democratizes access to startups so that everyone has a chance to invest, not just billion-dollar VC firms. Minimum investments sometimes start as low as $10, and crowdfunding portals make investing secure and straightforward. The bad news is a lot of founders don’t know crowdfunding is an option for them. Regulation Crowdfunding has been around only since May 2016, so it hasn’t had much time to gain traction. The good news is equity crowdfunding deals are better than ever. And we’re here to spread the word.